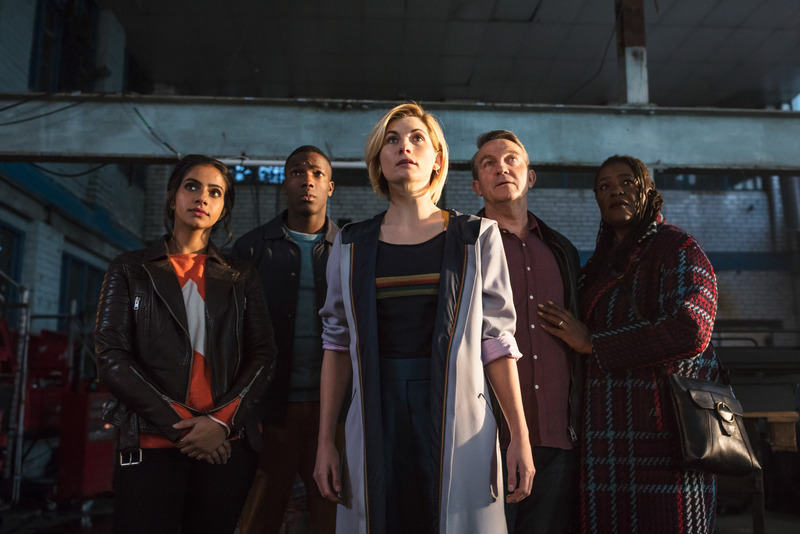 A new era of Doctor Who has dawned: under the leadership of showrunner, Chris Chibnall, Jodie Whittaker has taken over the TARDIS… although she’s yet to see the newly-remodelled TARDIS. The audience haven’t yet either. That’s because the Doctor has found herself in Sheffield, on a train being attacked by a big wiry ball of, uh, wires. But we’re a varied bunch here at the Doctor Who Companion, so what did the rest of us think? We spoke to just a few of the crew lurking around DWC Towers (sadly, it’s still under construction, and we’ve had to close the building site because some lunatics got up there and were jumping all over the place). So, I watched Doctor Who on Saturday and what struck me most were the changes Chris and the new production team brought to our favourite show. First, the visuals: it’s a slicker and more modern take than seen in the previous few seasons. The direction is clearly to the fore, and everything looks sharper. The look is further enhanced by the total revamp of the incidental music. It’s a bold choice given how established and much loved the music had become. But it felt right. As did the gorgeous rearranged title theme. All of these changes reflect the confidence of Chris and the new team, building on the success of the past but not tied to it. New monsters, and starting with a UK city never visited before on screen before made a refreshing change. But the real departure, for me, was the writing. It’s less jokey; the dialogue has a serious, more straightforward approach. That’s not to say there weren’t funny moments. But we have to remember that before it was driven by someone whose background is as a comedy writer. Albeit a genius comedy writer, with a brain the size of a planet, with crazy – sometimes confusing – concepts to match. There was more of a hard science fiction edge, but that served to bring out the reality of the body horror, which felt quite brutal at times. So, after watching The Leisure Hive (see what I did there?) the next night – SUNDAY NIGHT – I watched The Woman Who Fell To Earth. And apparently, there’s something very different about this new Doctor. Well, I couldn’t see much. A young, crazy approachable and quirky take that had clear echoes of Tennant and Smith. Much less spikey and alien than Capaldi. But maybe that’s what Doctor Who needs right now, a more reassuring and instantly likeable leading performance. Did I miss something? 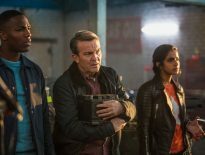 I was pleased to see that the smart-alecky, self-referential tone of much of mid-to-late Moffat has gone; this was a far more serious version of Doctor Who, with the humans behaving like real people who had real feelings: there was an emotional truth about the characters which we hadn’t seen for much of Moffat’s era. Mr Blue Face with Teeth, alas, was dull and derivative, with a costume out of a superhero film. Highlights: Bradley Walsh (superb), the incidental music, and the superb new arrangement of the theme tune. I’m glad to see the change of tone and style, though I haven’t quite adjusted to it yet. Cautiously optimistic for the rest of the season. Full disclosure: I didn’t want a female Doctor. But I did want to be able to say, “dang, Jodie Whittaker’s good.” Alas, I can’t say that right now. I should say, though, that having seen her in other things I know she’s a talented actor, but unfortunately none of this ability was in evidence in this episode. She gave a perfectly enunciated delivery but not a performance I could believe in, as I could see her turning the pages of the script. I say this as an amateur actor who frequently criticises himself in the same way. Come on Jodie – I know you have it in you. But what did I like about this episode? A fair amount. It looked gorgeous. It was atmospheric. A chilling baddie! The plot sucked me in and left me wanting more. Plus I know Sheffield well so it was really cool to see it on screen. And in Who! Also the new theme music was great and I thought the decision to omit the opening titles was a brave (and a successful) one. My gripes? So. Much. Cringe. I felt preached at through certain situations and lines of dialogue, and it’s unhelpful and patronising. These tendencies – together with some ropey performances – prevented the whole thing from feeling organic. It felt like a school media team had been given a budget. My overall score is a 5 out of 10, but I’m genuinely curious to see where it’s going. Full marks for effort, though. 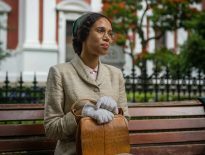 Of the many things the new series of Doctor Who achieved (with varying degrees of success) was to mark the start of a new era by contrasting with the previous. Inevitably this is most relevant in the comparison to the most recent run of shows. For my mind, the most striking contrast was the death of Grace. Arguably, there were too many new characters for them all to develop, but we had a sense of who Grace was, and her role in making her family work, yet there she lay dying on the concrete of a building site. 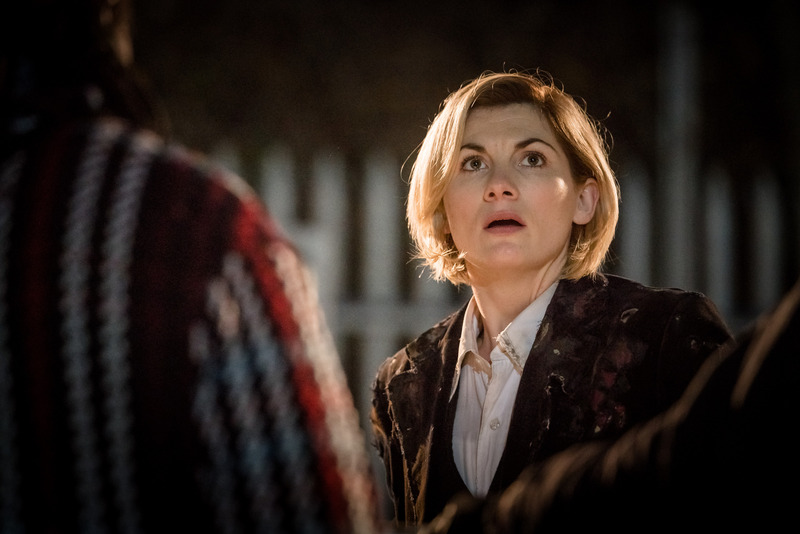 As the Doctor approached, still fresh from regeneration, a dark thought did cross my mind – was there going to be some fairy tale ‘it’s the regeneration energy’ cop out, but no, Grace was dead. From a plot point of view, it gave reason for Graham and Ryan to be prepared to travel (no such motive for Yasmin!) and should mean the pair need to mourn and bond in ways they couldn’t when Grace was alive. All this from the admission the world is a gritty place, and it’s not just ‘man with salad’ who gets killed. It also added to the length of the episode, and the multi-layered story had strands running at different paces, and the alien threat as a whole pocketed away as a MacGuffin – the real story is how change acts on a group of people and how their lives evolve. So, no avoiding the grim reaper, unless you’re the Doctor, and while the Doctor has yet to form a close attachment to this crew, death will always be hovering, and the peril (at least for the companions) will be more intense and more credible. Let’s hope this isn’t a one-off, not that I’m trying to kill off the TARDIS crew! For an episode full of emotion, I felt oddly numb throughout. It’s difficult as a fan to watch this show without half your brain comparing it to what has gone before. To me, the early scenes with Grace, Ryan, and Graham were strangely leaden. 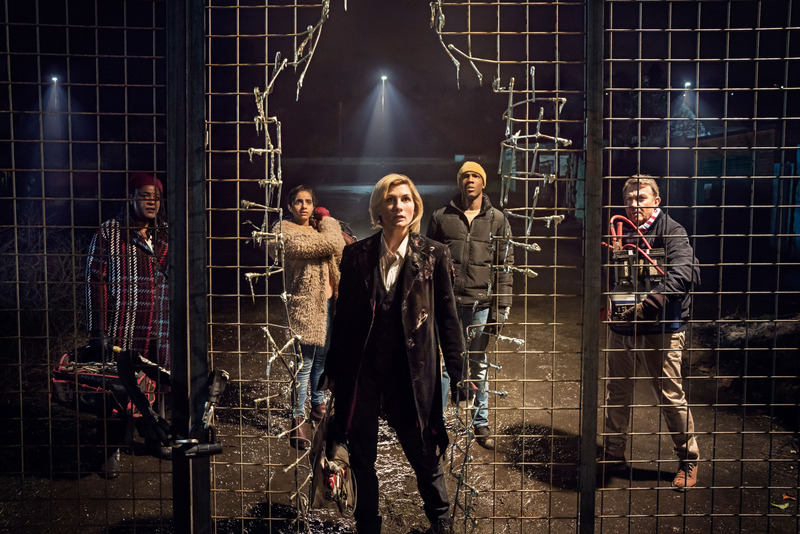 Few writers can write family dynamics as effectively and economically as Russell T Davies can, and it was his skill at this that The Woman Who Fell To Earth was sorely lacking. There was nothing particularly wrong with the episode, but I didn’t feel drawn in – I didn’t particularly care for any of the characters. 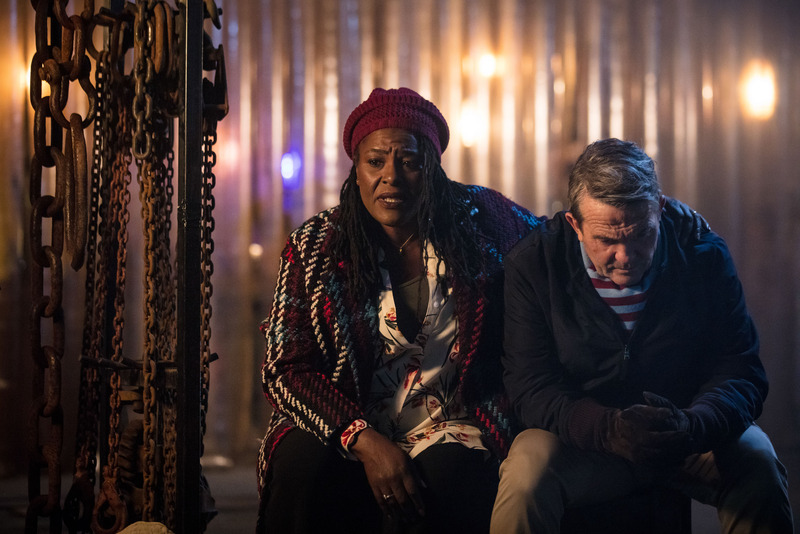 Even when Grace fell to her death, I didn’t feel the shock and loss that I should have (particularly as Sharon D Clarke’s was the strongest performance in the episode). The monster, Tim Shaw, felt like a rejected idea from season one of Buffy the Vampire Slayer (I was convinced initially that I was looking at a grimdark reimagining of Steve Ditko’s Spider-Man), the teeth motif gave him a Blue Peter design-a-monster competition runner up feel. The episode as a whole was fine, but not the bold, new restart we were led to believe we were getting. Still, Sheffield has never looked better on screen and the Yorkshire countryside is very photogenic (check out some of the later seasons of Last of the Summer Wine that were filmed in High Definition for further proof). It looked great, the CGI was good, and the plot reasonable. With a bit more pace in the script and direction, this could have been something special. This felt like traditional Sunday night drama: Doctor Who is back and this time it’s All Creatures Great and Small. Well, this really was all change and this could not have been further in tone from Twice Upon a Time. I loved the cold open – even if it does mean we forgo seeing the title sequence until next week. The new/old version of the theme sounds like a grower and it was fun to have it breaking through as the Doctor crashed in – making me think of the way the Bond theme tried to emerge throughout Daniel Craig’s Casino Royale. As for the story itself, it was traditional fare with moderately high stakes and there’s nothing wrong with that; we don’t need to save the universe every week. 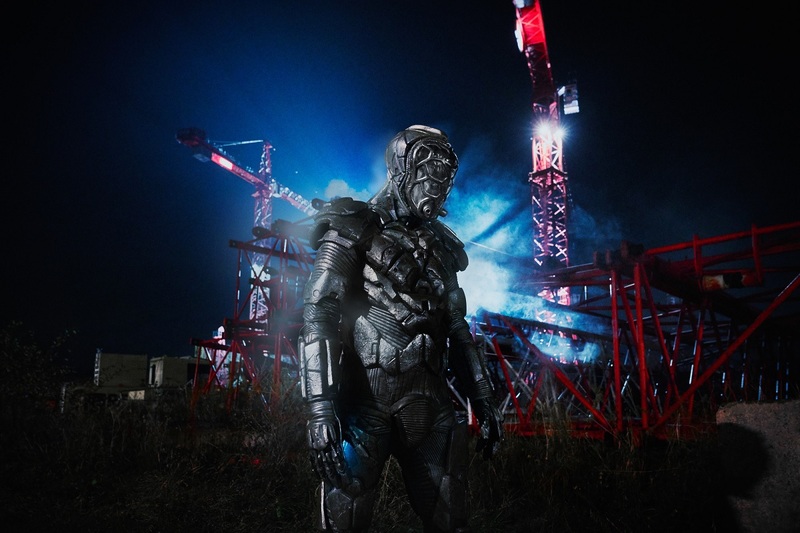 I enjoyed the flashes of the grotesque, like the impressive make-up job on Tim Shaw (even if his helmet felt a touch CBBC) and the swirly tentacle ball looked very impressive. I enjoyed “the friends” and found it interesting that we learned so much about Ryan, his deceased Mum and unreliable Dad, his wonderful Grandmother and, of course, Graham… yet next to nothing about Yasmin. It was a shame for Grace to die, as she was the one most ‘up for it’ but that’s doubtless the point and I hope we can resist any form of resurrection. 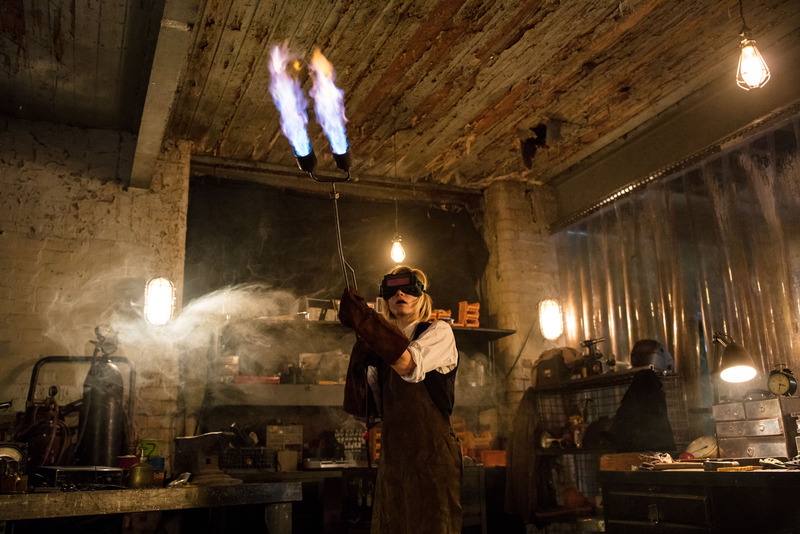 While it’s difficult to judge a Doctor on their debut, though many will, Jodie Whittaker’s energetic performance was never less than engaging with a welcome absence of shouty grandstanding. I adored her putting together her new outfit from a charity shop and the scene post-funeral where she talked about family felt like a perfectly pitched call back to The Tomb of the Cybermen, without feeling forced. The Heath Robinson contraption at the end, plus the glorious sonic screwdriver construction scene, were both promising too and that’s my real takeaway from this episode – lots of fresh energy and boundless scope. For me, it made for a refreshing change that the characters didn’t speak in that knowing, wisecracking way that has been the hallmark of Doctor Who dialogue in recent years. Probably inevitably for an episode with so much riding on it, the story was rather slight and, although I welcome the oft-declared intention that the programme will be accessible to all, I’m hoping for something more original from future episodes. There was rather more death than I was expecting in this new family-friendly version of the series, although I really shouldn’t have been surprised that former Torchwood showrunner Chris Chibnall pulled that show’s trick of killing off someone who had been set up as a regular in episode one – an event that leads me to wonder if the new crew will always be quite so harmonious as we may have expected? 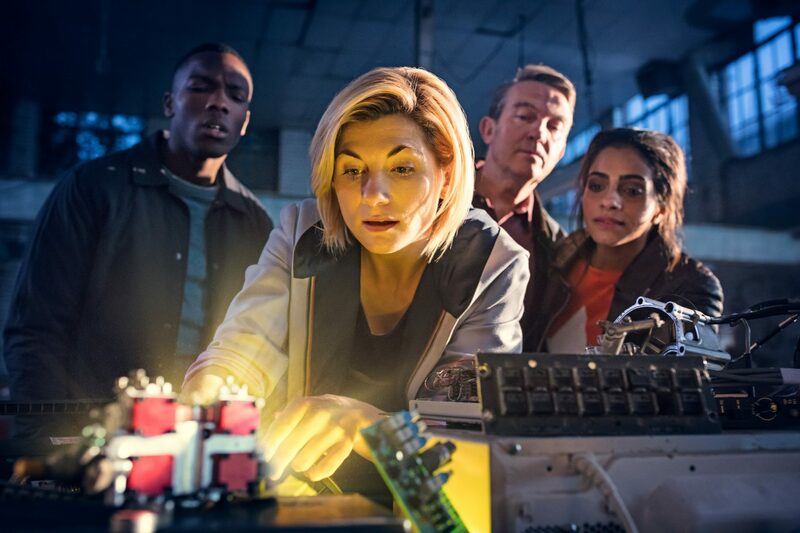 The ending, with the Doctor and her new friends literally lost in space, left open the possibility that this series will hark back to Doctor Who’s very earliest episodes. Oh, and what a treat that new (or should that be old?) arrangement of the theme was. In a way, this episode was cursed from its very inception. When you change everything at once – particularly the sort of changes we’ve seen over the past year or two – you loop a millstone of expectation around the neck of whatever it is you’re creating. It was never going to live up to the hype. The Blade Runner sequel didn’t, and they had a budget that would rival the annual GDP of some East European countries. What chance the BBC? As first stories go, I’ve seen worse. Oh, there’s no real plot, but that’s not a bad thing. The narrative in post-regeneration episodes always plays second fiddle to the establishment and development of both new Doctor and, where appropriate, new companions: that’s exactly as it should be, and in this instance the new TARDIS crew show great promise. It’s easy to look at this as a box-ticking exercise but they’re real people doing real things, and after years of smugness from Moffat, it really is a breath of fresh air. Most importantly, Whittaker herself is confident, sparky and believable – there are clear echoes of Tennant both in her manic technobabble and heartfelt reassurances to the people whose lives she’s forever transformed. Not everything works, of course. The social commentary is hopelessly shoehorned and the monster is about as derivative as they come – and you’re left, after the end credits have rolled, with a general sense of ‘meh’. Still, there’s a lot to like. With a pleasingly retro title sequence and refreshingly nonintrusive score, it’s a new direction I think I can get behind – along with a Doctor I’m prepared to follow, if only to see what she’ll do next. There would have been a lot of ‘fallen in my estimations’ jokes if this had been bad. 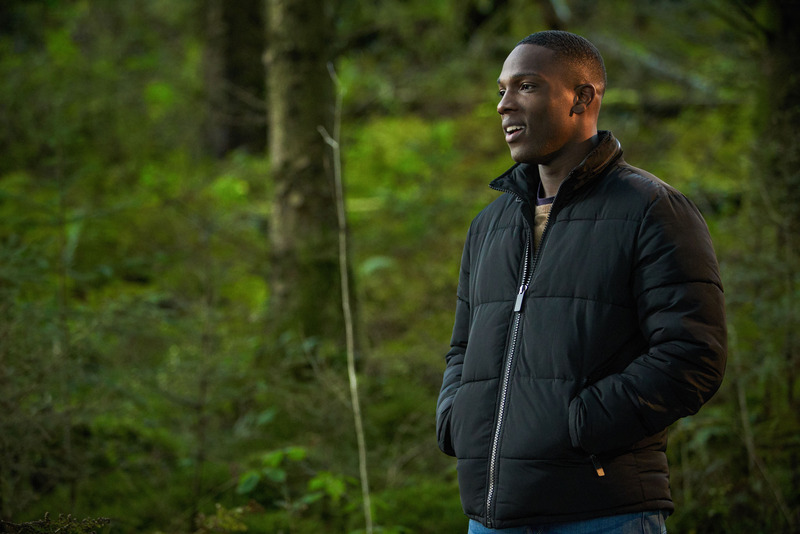 Thankfully, Jodie Whittaker’s debut was more of a flying start than a plummeting stop. We’re introduced to a Doctor who seems to be very unlike her previous self. She can babble with the best of them and it looks like the Doctor isn’t quite sure what words are going to come out of her mouth next. There was a lot to get into the hour’s running time. I didn’t think the plot was anything special, but the focus was really on the new characters – who are great so far. I always knew I would love Bradley Walsh (Law & Order UK was brilliant) and the other two won me over within the hour. We have another fun family dynamic going on. I wonder if the Doctor will give any Grandfatherly advice to Graham, if she can remember what that was like? Yaz and Ryan knowing each other from school was a fun little touch; these aren’t three strangers in the TARDIS together like in Castrovalva – they have built in relationships. New companions, New sonic… but no new TARDIS (yet!). That’s all I want out of this new era of the show: NEW! One sad thing. Bill would have been amazing with this Doctor. Cards on the Table – was I looking for faults or was it really mediocre? The slow opening was interesting, but would a non-fan know what was going on? I knew who Graham and Ryan were – and as for Yaz, probationer police officers don’t go solo. 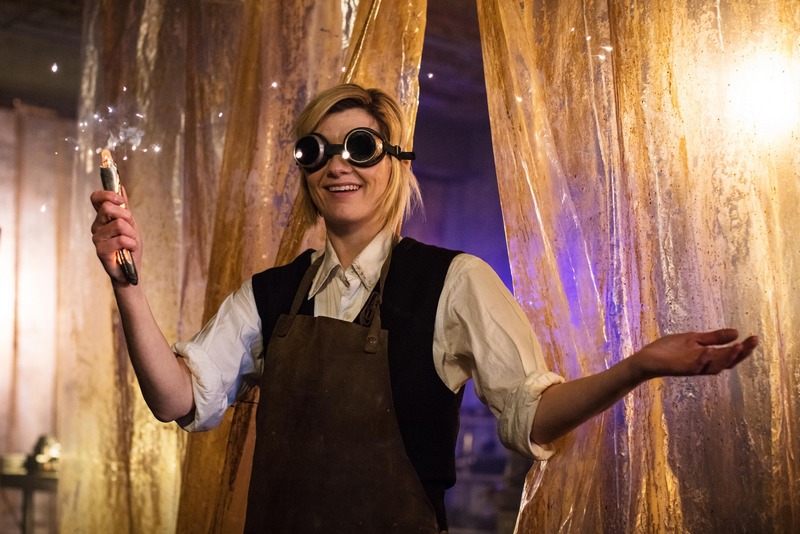 The Doctor crashing in was fun and the opening bars of the new theme tune made us aware that this is the Doctor – okay, everyone knew she was, didn’t they? Didn’t they? 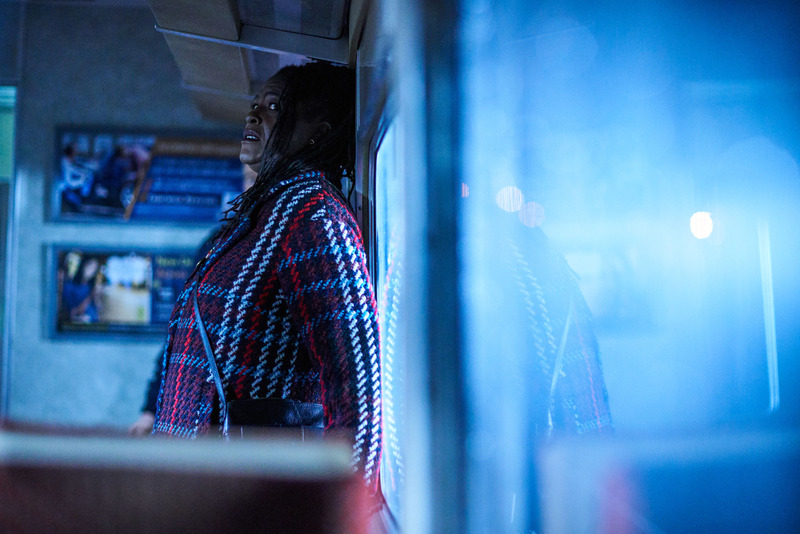 Monster on a train – not again. The story then crawls along, and we get regeneration energy and two pulses, so newcomers may realise she is not human. Re-engineering alien tech is no problem and then the story gets interesting and fast flowing. DNA bombs: like it. Alien monster with embedded teeth: like it. Killing with cold touch, cheating with a teleport: old hat. Death or glory bits: like it. Tricked alien: sort of like it. Grace as a nurse sort of reminded me of Grace the surgeon (from The TV Movie) but death of the only decent actor in the episode was not needed nor wanted. Cue end of episode, and the Doctor and companions in a circle holding jury-rigged electric wires – very Mawdryn Undead… and that had unexpected results as well. I promised myself not to judge the Thirteenth Doctor ’till I had seen the whole series, so episode one: very slow; good in parts; please bring back Grace. Once more to state my logic here: I’m not against the Doctor being female. I have nothing against Jodie Whittaker. My problem is the CHANGE. Had the Doctor been female from 1963 to 2017, and they changed her to a man, I’d feel exactly the same way. 1) How did she survive that fall? Of course, they didn’t explain the Tenth Doctor falling from a spaceship to the ground, either. Stop setting up these catastrophic regeneration events here and then never paying them off! 2) DNA Bombs were a weak threat. They didn’t DO anything. 3) The overall cinematic feel was amazingly good. 4) Likewise, I liked the new music. I know some had issues with Murray Gold, but he didn’t bother me. But I liked this stuff a lot. 5) I liked the characters had a bit of depth, something that’s been missing of late. 6) The misdirect with the blue hershey kiss. I thought it was the TARDIS. 7) Minor reference to Sylvester McCoy when she was melting down the spoons. 8) Speaking of that, how did she make a piece of alien tech with garage parts on Earth? 9) The enemy was weak (though creepy). But this kind of episode really exists to set up characters, so that’s not a surprise. Rose was like that. 10) “This’ll be fun” will probably be her “Allons-y” or “Geronimo”. However, my biggest hot take is the theme song. It’s by far my favourite version of the theme since John Nathan-Turner changed it going into the 1980 series. I’ve liked several theme tune variants since then, but man, it’s the best version of the theme tune since the ’70s. Bottom line: I didn’t hate it. I didn’t love it, either. It was just kind of there, but damn it looked gorgeous. As far as a “first episode of new Doctor” goes, it’s kind of meh. For perfection, there is always The Eleventh Hour. I rewatched The Eleventh Hour recently. It’s a work of genius. It’s funny, clever, confident, and looks gorgeous. You know what makes it particularly great? It’s Doctor Who, through and through. It’s not afraid to show off everything that makes this show great, without becoming inaccessible. It has an indescribable magic. Matt Smith is the Doctor straight away, and when he promises “all of time and space, anything that ever happened or ever will”, you know you’d run into that TARDIS and never look back. I mention all this because, despite having the same aims and the same runtime, The Woman Who Fell To Earth is in complete contrast to The Eleventh Hour. 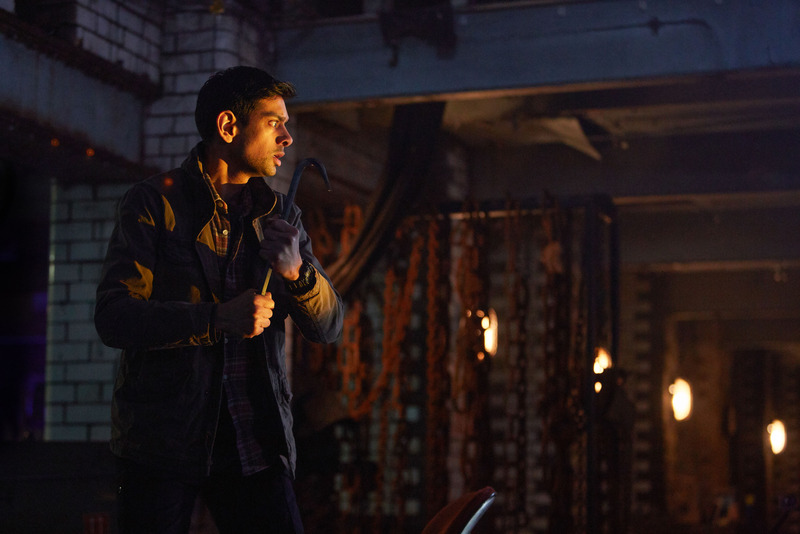 There’s a preachy tone, a forgettable villain, and a Doctor who, ironically, never quite lands. Perhaps the worst crime of all? It’s so boring. I can forgive a lot when it comes to Doctor Who, but I can’t look past a story that’s this tedious. Let’s not be overly negative. I did like Yaz and Graham. I liked the “Tim Shaw” bit. I enjoyed the Strictly Come Dancing Results Show afterwards. I guess the main problem with The Woman Who Fell To Earth was that it was science fiction… but it wasn’t Doctor Who. It was an odd amalgamation of Class and Farscape, maybe with a dash of Star Trek or Star Wars. I like some of those shows, but none of them are Doctor Who. I hope my favourite series gets its magic back soon; until then, I’ll stick with my Mad Man in a Box. I should have seen this coming. As the years have gone on, various factors have worn away at my hardened, sarcastic teenaged geek exterior exposing the sentimental sarcastic adult within. Having seen enough Broadchurch, I should have known Chibnall would know where my vulnerabilities lie. Sure enough, he got me fully red-eyed, nay, teary, by the end of The Woman Who Fell To Earth. I KNOW Chibnall can do that and in all the excitement around the first lady-Doctor and a new filmic lenses I’d totally forgotten. But – what a Doctor! And what beautiful cinematography! Dear reader, I LOVED it. It wasn’t the best story ever, but it was fine and it gave the characters room to breathe. It felt somehow more like Classic Who in that respect – an unlikely family, thrown together by cosmic events in an unlikely place. Jodie totally convinces (I knew she would) – there were hints of Eccleston (“give me a minute, I’m workin’ on it!”) and Smith (“can we ‘ave the lights and sirens on?”). This was fun and sincere. Where camp and bombastic music sometimes intruded on previous versions of NuWho, this felt perfectly balanced and like it was taking itself just seriously enough. In fact it, more than anything that’s gone before, this felt more like a movie version of Doctor Who. So I’m stoked – love the first instalment and can’t wait for more Whittaker! ← The Woman Who Fell To Earth: Where in Doctor Who Have I Seen This Before?